New Wizards vs Aliens App Offers the First Synchronized Second Screen Experience for a Kids' TV Show in the U.S.
BURBANK, CA--(Marketwired - May 30, 2013) - FremantleMedia Kids & Family Entertainment and Magic Ruby, the leading provider of technology and apps for the second screen, today announced the upcoming launch of Wizards vs Aliens on Hub Network will be supported by a first-of-its-kind second screen app available exclusively on iPad. Marking the first dedicated second screen experience for a kids' TV show in the U.S., the Wizards vs Aliens app is available now on the App Store, two days prior to the show premiere on Hub Network on June 1, 2013. The app offers a comprehensive and robust Wizards vs Aliens experience, providing content above and beyond what can be experienced in the broadcast TV universe. Consumers will have an opportunity to sync the app with actual episodes of the show, providing immersive content to enhance their viewing experience. As viewers progress through the series and continue using the sync feature, they will unlock additional content relevant to each episode and the progression of the storyline. Fans of the show will also become further engaged in the storyline with interactive polls, alien-inspired quizzes and collectible character sets. In addition, exclusive on-set and character photos will draw fans into the creative process behind the making of the show. As fans continue to engage with and explore the app, they can unlock special rewards for their efforts. Should they want to encourage others to recognize their show knowledge and fan status, a special "Wish List" can be e-mailed to parents that will allow them to highlight all the great Wizards vs Aliens products they hope to receive such as T-shirts, hats, puzzles, and more. The Wizards vs Aliens app, created by Magic Ruby, also offers a unique educational experience, engaging kids in factual science-based content. Kids have an opportunity to further explore the science inspired geology and geography featured in the spellbinding adventures from the Wizards vs Aliens TV show. "FremantleMedia has been a pioneer in the second screen experience for some of the biggest entertainment shows in the world, such as American Idol and The X Factor, in turn making them two of the most socially relevant shows," said Nicholas Dale, Senior Manager of Interactive and Mobile, FremantleMedia. "With today's youth utilizing mobile technology at an increasing rate, we're thrilled to now be the leader in bringing a second screen experience to the kids' market." "We're excited to partner with FremantleMedia on the second screen companion app for Wizards vs Aliens," said Tom Engdahl, President and CEO of Magic Ruby. "FremantleMedia is a global leader in creating compelling content for kids and families; we believe this first-of-its-kind app is the perfect vehicle to immerse fans more deeply into the Wizards vs Aliens universe." Created by Russell T Davies and Phil Ford -- the creative force behind Doctor Who, Torchwood and The Sarah Jane Adventures, Wizards vs Aliens follows the adventures of two 16-year-old schoolboys, Tom and Benny, who battle to save Earth from the Nekross, an alien race. While Tom lives a seemingly ordinary life with his dad and grandmother, he hides a deep secret: his family members are wizards. So when the Nekross arrive to attempt to steal all the magic from Earth, they haven't expected resistance from Tom and his friend, science super-brain Benny. Together they form an extraordinary alliance using Tom's magic and Benny's science to battle the Nekross and save Earth. The wildly popular series originally debuted in the U.K. where it was the number one show in its time slot amongst all channels for children 6-12 and children 10-15. Wizards vs Aliens will make its U.S. debut on Hub Network with a two-part episode Saturday, June 1, 7:00 p.m. and 7:30 p.m. ET. New episodes will air weekly Saturdays at 7:30 p.m. ET. Wizards vs Aliens is filmed in Cardiff and produced by BBC Cymru Wales in association with FremantleMedia Kids & Family Entertainment for CBBC. FremantleMedia manages worldwide distribution of the series outside the UK, as well as brand licensing, home entertainment and other ancillary rights including publishing. The Wizards vs Aliens app is available for free from the App Store on iPad or at www.AppStore.com/WizardsvsAliens. FremantleMedia is one of the leading creators, producers and distributors of television entertainment brands in the world. FremantleMedia is part of RTL Group, the leading European entertainment network, which is in turn majority-owned by the international media company Bertelsmann. FremantleMedia is responsible for many of the world's highest rated prime time entertainment, drama, serial drama, factual entertainment and kids & family programming, with market leading capabilities that extend from content creation to licensing, digital and branded entertainment, gaming and home entertainment. The FremantleMedia Group (which includes FremantleMedia North America, UFA, FremantleMedia UK, FremantleMedia Australia, Ludia, @radical.media and Original Productions, among others) has one of the most comprehensive global networks with operations in 22 countries, creating over 9,200 hours of programming a year, rolling out more than 60 formats and managing over 300 individual titles. The company also distributes more than 20,000 hours of content in over 150 countries. FremantleMedia has some of the world's most sought after and long running formats in its catalogue, and globally produces such programmes as: Idols, Hole In The Wall, Got Talent (co-produced with Syco in the UK and the US), The X Factor (co-produced with Syco in the UK and the US), Take Me Out, Family Feud, The Price is Right, Farmer Wants A Wife, Gute Zeiten Schlechte Zeiten, and Neighbours. Magic Ruby is a company dedicated to monetizing the Second Screen by integrating state-of-the-art technology into the TV viewing experience. Its mission is to enable content owners, distributors and brands to generate incremental revenue from second screen viewership. Magic Ruby's suite of products and services include immersive second screen apps, infrastructure services for app publishers, and a platform to serve targeted advertising to viewers on the second screen. For more information, please visit www.magicruby.com. Hub Network is a multi-platform joint venture between Discovery Communications (NASDAQ: DISCA, DISCB, DISCK) and Hasbro, Inc., (NASDAQ: HAS) with a goal of entertaining, enlightening, empowering and educating children and their families. The cable and satellite television network features original programming as well as content from Discovery's library of award-winning children's educational programming; from Hasbro's rich portfolio of entertainment and educational properties built during the past 90 years; and from leading third-party producers worldwide. Hub Network's lineup includes animated and live-action series, as well as specials, game shows, and family-favorite movies. The network extends its content through a robust and engaging online presence at www.hubworld.com. Hub Network rebranded from Discovery Kids on October 10, 2010, and is available in nearly 73 million U.S. households. The Hub Network logo and name are trademarks of Hub Television Networks, LLC. All rights reserved. 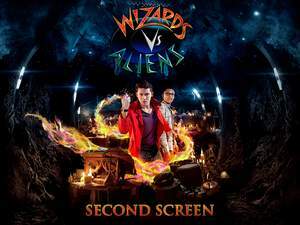 WIZARDS VS ALIENS APP BRINGS THE FIRST SYNCHRONIZED SECOND SCREEN EXPERIENCE TO A KIDS' TV SHOW IN THE U.S.